Now Gyan must face all her demons—public as well as private. This story dates to my phase — 20+ years ago — of my experimentation with including “traditional” fantasy elements in my historical Arthurian series titled The Dragon’s Dove Chronicles (Dawnflight, Morning’s Journey, et al). I found it quite by accident recently on a flash drive that I hadn’t accessed in awhile and decided it would be a great offering for my fans while I finish writing book 3, Raging Sea. 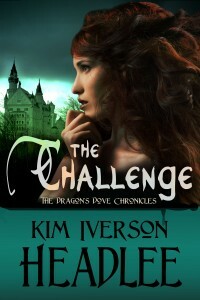 As with all my fiction, The Challenge has been professionally edited and graced with a professionally designed cover branded with the teal color scheme indicative of my shortest works in The Dragon’s Dove Chronicles series. My Arthurian characters are bred from decades of research and study of the ancient legends and their more recent interpretations by other authors. The hallmark of all my fiction, Arthurian and otherwise, lies in portraying strong but flawed characters who evolve (for better or for worse) via their interactions with each other. This applies to minor as well as major characters in each of my books. Gyan, the central character of The Challenge, represents my primary literary mission with The Dragon’s Dove Chronicles: to present a Guinevere character the reader can actually =like=, for a change.